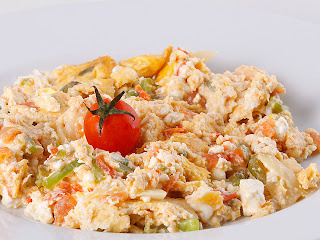 Mish-Mash is a type of Bulgarian omelet. It is a fried beaten up eggs with peppers, tomatoes and feta cheese. Cut the ingredients into small pieces. Heat the oil in a frying pan, add the onions, then the peppers and the tomatoes and cook for about 5 minutes. Add the cheese and eggs and cook for another 3 minutes. Sprinkle with parsley and serve.